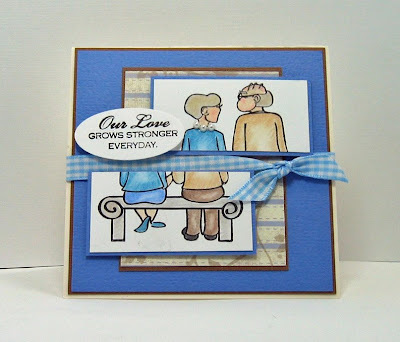 Today I made a card for Darnell's Blog birthaversary Surprise NBUS Challenge! 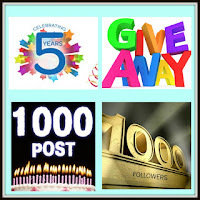 She is celebrating so many things you will just have to check it out here to see what all the hubbub is about. 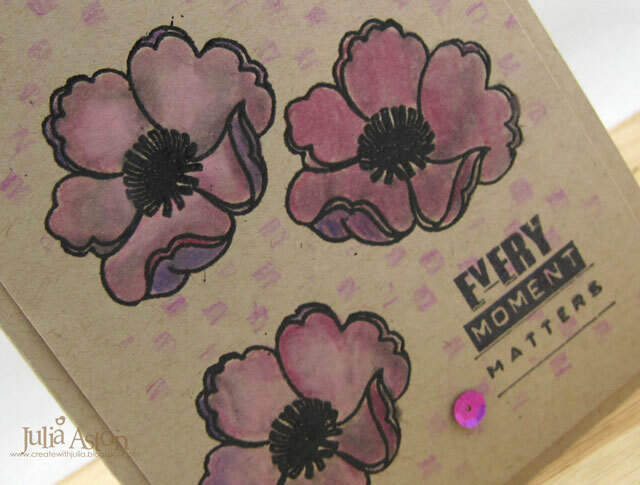 The flower stamp is my NBUS - it's from a stamp set called Artful Life by Wendy Vecchi - I've used other stamps in the set (such as this sentiment) but not this particular flower. I used colored pencils and Gamsol - a technique that you can find on YouTube and Splitcoast stampers. I black embossed my flowers and the Gamsol seemed to melt it a little so there are some dark smudges as well as the colors - but I kind of like the shadowy look! I laid a Check Mate stencil over the panel and colored in some of the squares randomly with a colored pencil - trying to ground the flowers a bit. Then I just added 3 sequins. I haven't used the Gamsol colored pencil coloring technique in many years but did have all the supplies in a drawer in my craft room! You can see other cards I have made using this technique here. I need to practice it more - but this will do for now! Some come and join us over at Darnell's NBUS challenge - she's running one every week for 3 weeks for her special celebration! See it all here. 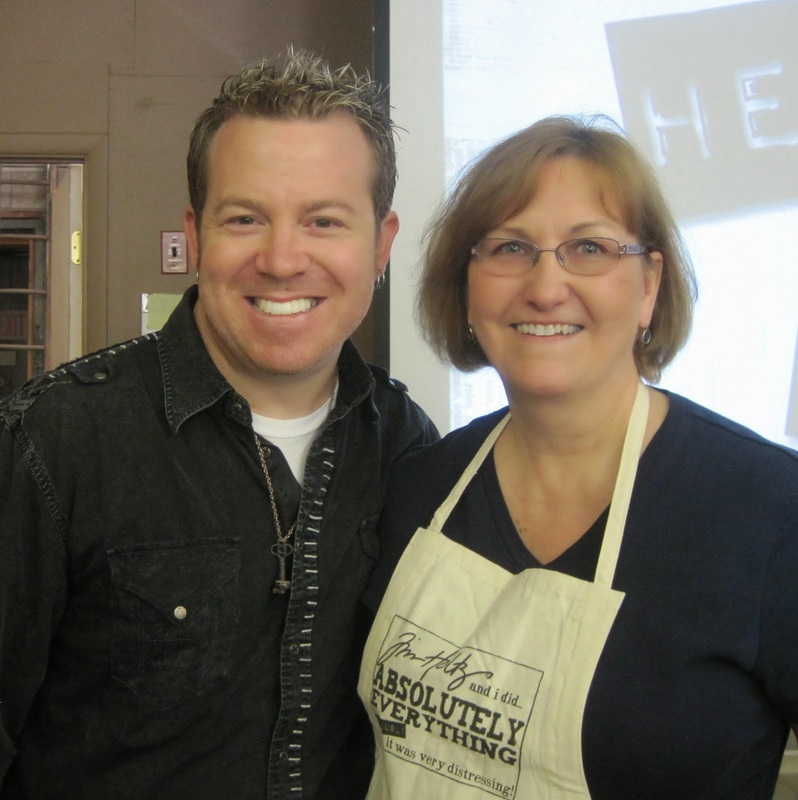 Thanks for making stamping so much fun Sis! Accessories: Gamsol, paper stump, Fantasia Color Pencils, Check Mate Stencil - Wendy Vecchi/SA, black embossing Powder, heat tool, sequins - Neat and Tangled. 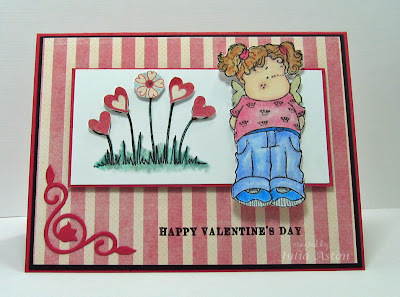 Today's featured stamper over on Split Coast was Jaydekay and I chose this pretty Valentine of Judy's to CASE. I used a different Tilda than she used and different flowers butI did follow her overall design and theme of stamps. The corner piece is punched from a Cuttlebug die. 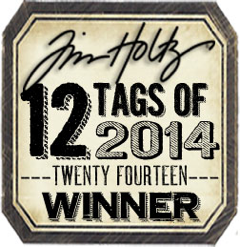 I was so happy to use one of my Tilda's by Magnolia Stamps. I bought about 8 of them quite a while ago and have only used one of them so far. So I'm following one of my New Year's Resolutions - to use the stuff that I have! The sentiment is from the Sweet Love set by Papertrey Ink. I cut out hearts from a designer paper and popped them up over the stamped flowers to make it more Valentine-ish! I colored Tilda with Koh I Noor pencils and gamsol. Remember to check out my blog candy on Saturdays post- you have until Monday night to post a comment there for a chance to win! 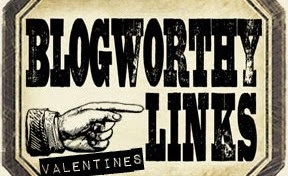 I just checked Heather's site and it looks like Our Love is no longer listed - so it must be all sold out - if you haven't gone over there already and want to get some great deals on stamps check it out before midnight tonight because that's when her blowout sale is over. She still has a lot of cute sets left so check it out! Thanks so much for coming by today - be sure to add a comment on this blog entry to have a chance at winning a Percy stamp from H&M I'll post the winner Thursday night! What a fun 'Try a New Technique' challenge this week over on Split Coast! It's called Black Magic and you can see the instructions here. 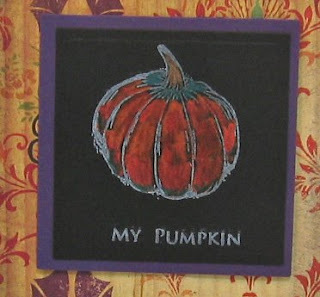 Basically - you stamp with white craft ink on dark paper - then color inside the image using colored pencils and gamsol (odorless mineral spirits). You just dip the tip of the pencil into the gamsol and then color on your paper. 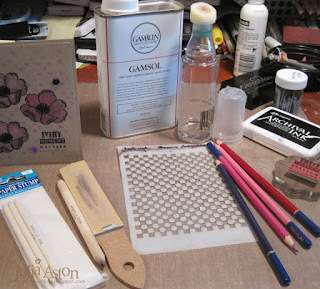 The gamsol melts the pencil color a little bit so it glides on smoothly. I love how this came out! I used two colors of orange, a green and a brown on this. 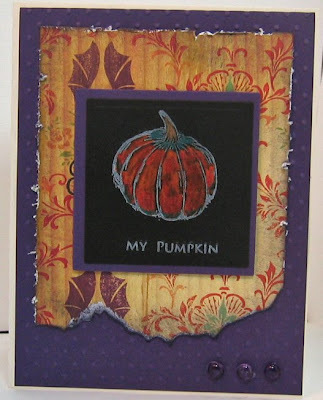 The pumpkin and sentiment are from a newly released set from H&M stamps called Old Fashioned Hayride that you can see here. The fun designer paper is from Cosmo Cricket. I tore the bottom edge, distressed the other three and sponged all the edges. The squares are cut with nestabilities. 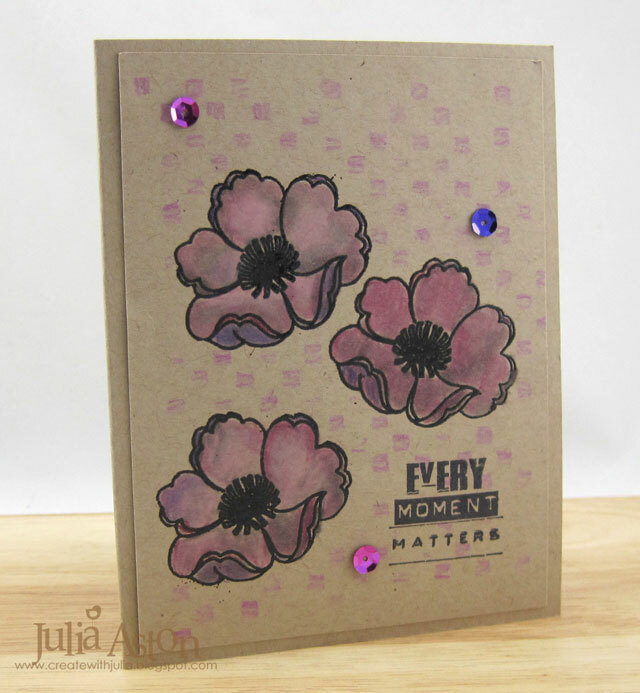 I used the Swiss Dots cuttlebug folder and added 3 purple dew drops. Heather is offering free shipping for the month of September - so hope on over and see what sets you absolutely have to have - might as well save money right?! 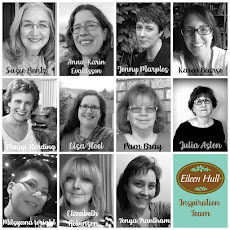 And be sure to check out the other Design Team Members cards - you can find links to them on Heather's blog here. I was the host for this weeks Double Dare Challenge that I do with a small group of friends at Split Coast. 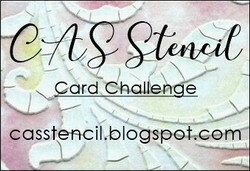 For my challenge - I sent everyone this stamped image of Tilda by Magnolia Stamps as well as a piece of designer paper - some got this one from Stampin Up and some got a piece from PapertreyInk. You could add anything else you wanted - you just had to use the image and the designer paper. I cuttlebugged the card with the Polka Dot folder but you can only see one line of dots at top and bottom! I used the Gamsol method of coloring with watercolor pencils and you can see a Splitcoast tutorial for that here. 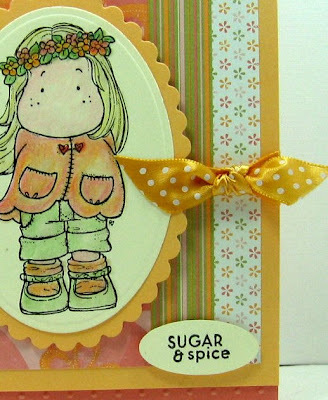 I just love these sweet Tilda's - they have her in many outfits, sometimes sitting, sometimes holding flowers or sweeping. Magnolia is a company in Sweden and you can see the European influence in their designs. There is a boy named Edwin and other characters as well. They also have flowers, benches, chairs, walls and I just saw a whole new summer line listed on their site today. But back to my card...... I used my Petite Oval Nestabilities to frame Tilda and mounted the ovals with foam dimensionals. I added the pretty ribbon from PapertreyInk underneath the oval and tied a small piece in a knot around the flat piece. The sentiment is from PapertreyInk Favor It Baby set and I just stamped it in Onyx Black and punched it with my SU oval punch and mounted it with foam dimensionals. You can see the other's Tilda cards here. They'll be loading them all week. There should be 9 of them when everyone is done. Accessories: Petite Oval nestabilities, oval punch, Gamsol, paper stump, Prismacolor watercolor pencils, ribbon: Summer Sunrise Swiss Dot Satin; PTI, cuttlbug, Polka dot folder, foam dimensionals.